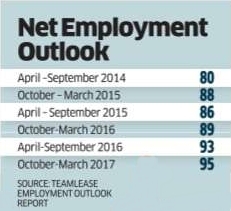 Employment outlook in India has hit a three-and-a-half-year high for October 2016-March 2017, as per the latest half-yearly TeamLease Employment Outlook Report, driven by positive economic sentiment owing to a combination of factors including substantial private and foreign investment, rapid growth of knowledge services and the government's continued focus on Make in India and Startup India programmes. But even as employment outlook has improved, job growth has slowed in several sectors and markets seem to be levelling off after nearly five consecutive periods of significant acceleration from the first half of 2014. The report, published by the staffing firm has seen both employment and business outlook increase incrementally from the already positive sentiment of the previous half-year. The net employment outlook has gone up by 2 percentage points to 95, and business outlook by the same margin to 97. The most notable increase in employment outlook has been in sectors such as healthcare and pharmaceuticals (4 points up to 94) and telecom (4 points up to 87), followed by new age sectors such as IT, ecommerce and internet startups, which are both up 1 point each to 99 and 87 respectively. The net employment outlook is the difference between the number of respondents who are inclined to hire and the number of respondents who are disinclined to hire over the next six months. The outlook is expressed as a percentage of the total number of respondents. For this half year, 96% responded positively (hiring would increase), 1% responded negatively (hiring would decrease) and 3% responded saying there would not be any change in the volume of hiring, from the previous half year. The net employment outlook, therefore, would be 95. Kunal Sen, senior vice-president of TeamLease, however, said that while employment outlook has reached a high, job growth has slowed down in sectors such as FMCG and durables, IT, ecommerce and internet startups, retail and manufacturing, engineering and infrastructure. IT is an example, he said, where almost all companies will be hiring, but in lesser numbers because of more automation coming in. Similarly, startups will continue to add numbers. Exceptions include sectors such as telecom and financial services, which are expected to see higher job growth compared to the previous quarter. Though job growth has slackened, net sentiment is positive across the country , with the incremental sentiment in tier-II and tier-III towns better for this half year, compared to the previous six-month period. This indicates how many businesses are planning to expand into these areas. More small businesses are optimistic about hiring during this period.Many of these are startups that have survived the challenges of funding woes. In contrast to the previous half year, however, businesses are looking to scale down entry-level hiring, which has fallen 5 percentage points to 65. A significant increase in senior-level hiring sentiment (up 4 percentage points to 36) is a highlight for this half year. The TeamLease Employment Outlook Report provides an overview of hiring sentiment and trends across 16 key sectors and eight major cities in India. Eight new sectors have been assessed in this edition of the report including BPO, KPO, educational services, media and entertainment, travel and hospitality, agrochemicals, construction and real estate, and power and energy .